The Moho Cay Lodge is located on the Moho Cay private island, an idyllic tiny white-sand, palm tree covered island in the spectacular Port Honduras Marine Reserve at only 30 minutes boat ride from Jungle Camp. Solar panels provide electricity for ceiling fans and lights, and the sun also provides warm water for showers. The lodge has a nice restaurant and bar where a professional chef is available to prepare fresh-caught fish, lobster and conch from the nearby reef. Each of 8 cabins at Moho Cay Lodge has it’s own private stretch of beach surrounded on both sides by tropical island vegetation. The lodge consists of raised luxury safari style tents covered by a thatched roof. The tents are very spacious with hardwood floors, wicker furnishings, and tiled bathroom with walk-in shower. The verandas actually extend out over the water with panoramic view of the blue, blue Caribbean Sea. 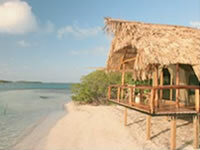 At Moho Cay Lodge you will be able to enjoy half and full day tours of snorkeling, swimming, and sea kayaking. Sites for exploring nearby include Payne's CreekNational Park, Ycacos Lagoon, Wild Cane Cay, the Seven Hills, and Middle River. Reservations at Moho Cay are only available for guests departing from Jungle Camp.